Led by returning Event Chair Bobby Genovese, the 3rd annual Boat Rally for Kids with Cancer raised over $700,000 for the Hospital for Sick Children (SickKids). The highest participating fundraiser was Team S2G, captain by Oliver Bock with an astounding $157,934.80. The winning team of the Boat Rally was Team Mercury, Skip by Adrian Rushforth with Celebrity navigator NHL Alumni; Mike Krushelnyski. The Boat Rally is a unique and exciting boating event that has put the Fun into Fundraising, featuring family-fun, celebrities, thrilling challenges and cottage adventure with the goal of raising funds for pediatric cancer research, treatment and care. “When we come together and choose to fight children’s cancer, we are making a difference in the lives of those most in need,” said Genovese. Fuelled by an ambitious schedule of pit stops locations set along a route across the beautiful waters and cottages of Muskoka, Boat Rally teams had to work together to decipher clues and riddles that took them on a journey from one location to the next. The final destination was the Gala BBQ Dinner at Rocky Crest where Rally drivers, celebrities, sponsors and invited guests reveled in their memories from the day while enjoying an incredible dinner and award-winning entertainment, with live auction and the Scavenger Cup awards ceremony. Celebrity navigators included: Billy Baldwin – Actor, Gossip Girl, Hawaii Five-0, The Squid and the Whale, Backdraft; Catherine O’Hara – Actress, SCTV, Home Alone; Heather Moyse – 2x Olympic Gold Medalist, Bobsled; Jason Priestley – Actor and Director; John Salley – NBA Alumni, TV Host; Leo Stakos – TV Host, Fish TV; Marty McSorley – NHL Alumni and Mike Krushelnyski – NHL Alumni. SickKids is one of the top children’s hospitals in the world; renowned for its world-class patient care, research, education and advocacy. Through donor support, SickKids has become a charity that strategically invests in research and training programs that have the potential to improve the health of children across Canada and around the world. Cancer is the most common cause of disease-related death among Canadian children, and the rate of occurrence continues to rise. This world-renowned place of research, healing and hope, sees approximately 360 new cancer patients each year. 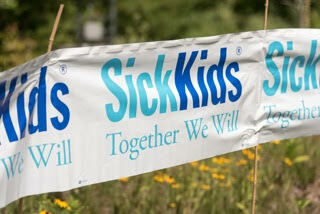 All Rally participants and celebrities share the SickKids vision: Healthier Children, A Better World.